Debt is a prison of our own making but a prison no less. There is a path to freedom. I am a Dave Ramsey Financial Master Coach with a desire to help you get a handle on your finances. I am not a financial advisor and do not sell any products. I help you create a budget, pay off debt and make progress on your financial goals. 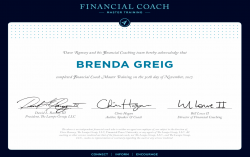 If you’ve gone through Financial Peace University, Dave Ramsey’s program, but have fallen away from it or have struggled with something, a financial coach may be just what you need to get going and stay accountable—it was for me and my husband. My husband and I took Financial Peace University and did well for about six months but we disagreed a lot and old patterns of behavior resurfaced. We couldn’t figure out a resolution to our differences so we stayed stuck. It wasn’t until our financial situation got really bad that we finally reached out to a Master Coach and got the help we needed. It has literally changed our lives! Dave’s program has helped thousands of people. But sometimes the training program isn’t enough and you can benefit from outside counsel. Get freedom from financial strain and the stress it causes.